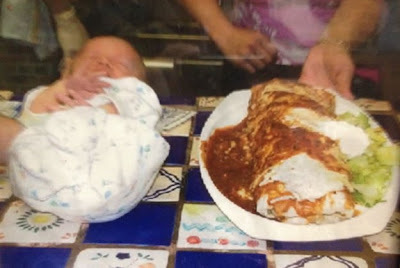 Admit it - you've been to a Mexican restaurant, ordered a gloriously delicious burrito, and when it arrives at the table, you marvel at its magnanimous size and comment: "It's the size of a baby." You're not the only one, and a restaurant in Seattle noticed: Gorditos is marketing its Burrito Grande based on how closely its size matches an actual baby's size. And they invite you to post pictures of your baby next to a Burrito Grande on their Facebook page.